Jayne has worked at Gadsby’s for over eleven years. Her principle role’s are cleaning oil paintings, repairing frames and repairing china having been involved in the china business for many years previously. 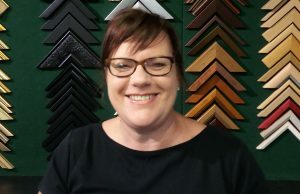 Jayne can also be found on the shop floor in the art and craft departments or advising customers with their framing requirements. Away from work Jayne has a keen interest in painting and fabric sculpture.